Sometimes your compass needs repair, or loses its heading. Check it now. 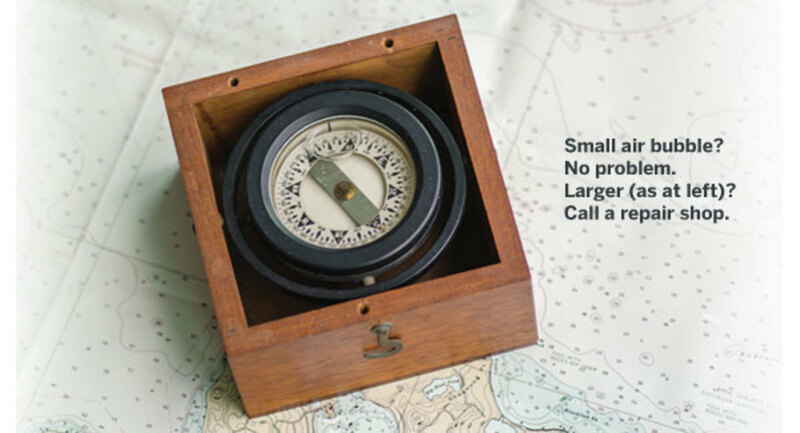 No piece of gear onboard is more loyal than your magnetic compass. Even an inexpensive model will keep pointing north for years, demanding no more care than the occasional spritz to clean off its dome. And when the seagull hits the propeller and the GPS system goes down, or your boat’s DC system is fried by lightning, or you suffer some other onboard apocalypse, your compass will remain your best friend, guiding you home along the earth’s magnetic field like a seeing-eye dog, without the input of a single electron. So why not give your compass a little TLC? 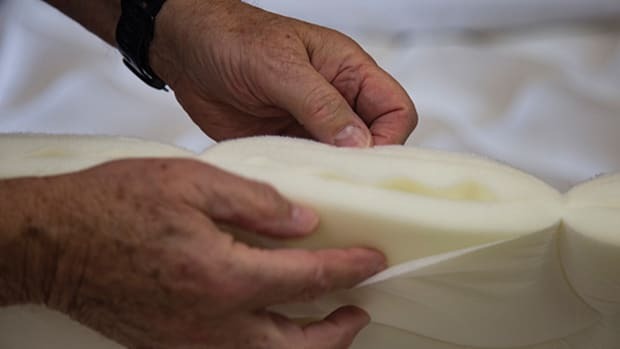 To get started, here’s some advice on compass maintenance from a pro. In his 30-plus year career, Capt. Jeffrey Kaufmann of Cape Compass (www.capecompass.com) in Falmouth, Massachusetts, has serviced and adjusted compasses on yachts, tugboats, ferries, and U.S. Coast Guard and Navy vessels, even miniature submarines. Basically, there are only a few things that can go wrong with a compass, says Kaufmann: Mechanically, it can become hard to read because of a cracked dome or contaminated fluid; it can leak, causing a bubble in the fluid which, if allowed to grow, will interfere with damping of the dial; or it can become “sticky,” a condition that prevents the card from rotating smoothly. 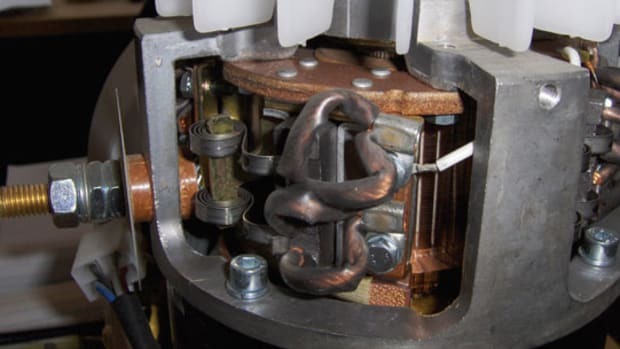 “This last problem can be caused by a worn pivot bearing,” says Kaufmann, “or the card can ‘run aground’ for some other reason.” And even a mechanically perfect compass can exhibit deviation, an error in the heading due to magnetic activity aboard the vessel. All these problems are best handled by a professional compass adjuster or repair shop. A bubble or cracked dome is easy to spot, by the way, but a sticky pivot’s not always so obvious. Test your compass by deflecting its card 3 to 5 degrees with a magnetic object, e.g., a screwdriver or pocketknife, placed next to the E or W point of the compass. Let the dial come to rest, then remove the object and see if the dial returns smoothly to its original heading. 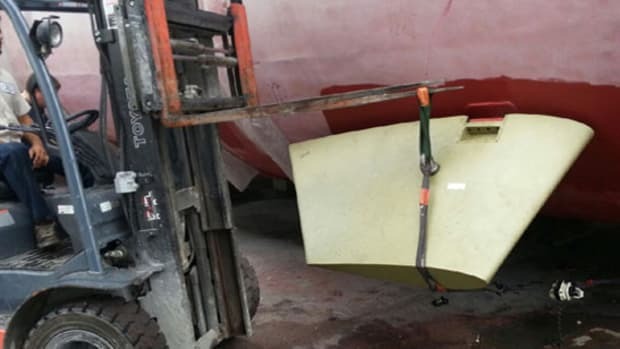 Do this with the boat tied to the dock and absolutely still, says Kaufmann, since any movement, even vibration from a running genset, will shake the card enough to affect the outcome. If the cost of any given repair is more than about 60 percent of the cost of the compass, it’s generally best to buy a new one with a factory warranty. However, if replacing your compass with a new model would be tricky, or require cutting new holes, it’s often better to fix your old one. And if it can be repaired without altering its built-in correction system, you’ll save the cost of adjusting a new compass. Ritchie (www.ritchienavigation.com) builds a wide assortment of compasses at reasonable prices; if you want something a little more exotic, try a made-in-Germany C. Plath (www.weems-plath.com). Compasses rarely need repair, so choose carefully—you’ll be using it for a long time. Even a new compass—especially a new compass—can lead you astray if you don’t have it compensated before hitting the trail. 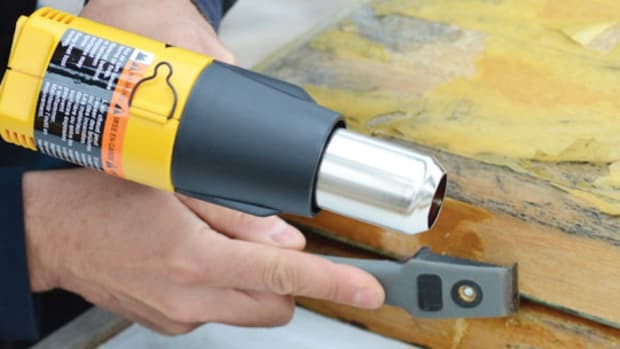 Ditto if you’ve had your old compass repaired; upgraded your electronics near the helm; or had major work done at the yard (particularly if you have a steel boat and the work involved welding—welding changes the residual magnetism in steel). Any magnetic force close to the compass—even the energy around 12-volt wiring—can induce deviation, too. (Be sure any wire pairs near the compass, especially the wires to the compass light, are spiraled together, like the twist tie on a bread wrapper, to prevent this.) Deviation usually varies with the boat’s heading, reading too high on some headings and too low on others, as the relative positions of the compass and the boat’s magnetic influences change. Don’t confuse deviation with variation, the difference between true and magnetic directions caused by the separation between the magnetic and terrestrial poles. NOAA calls variation declination, but whatever you call it, variation or declination, it’s the same for all compasses in the same geographic area; it doesn’t vary with heading, but changes as you move from one geographic place to another. Check www.ngdc.noaa.gov/geomag-web to find the variation for your location on a specific day—variation changes over time, but very slowly. The navigator corrects for variation by adding or subtracting it from the true heading: “Error west, compass best”—add westerly variation to get magnetic heading, subtract easterly (“Error east, compass least”) to get it, and vice-versa if correcting from magnetic to true. Deviation, on the other hand, is offset using compensating magnets near the compass to minimize the boat’s magnetic field. 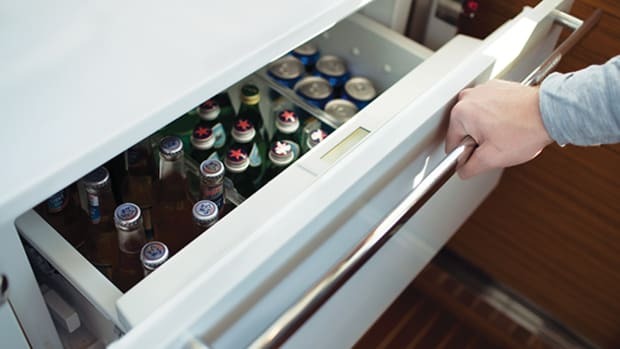 (Compensating magnets are usually built into the compass, but sometimes extras are required.) 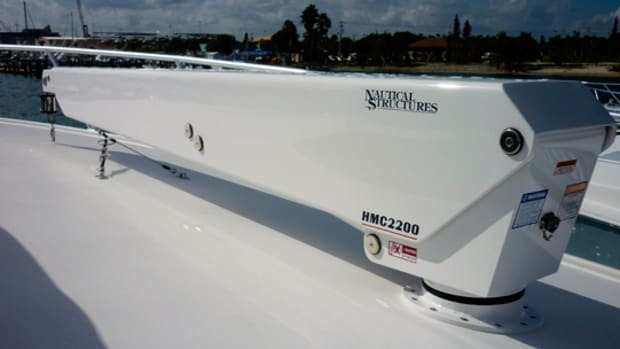 When a boat is first commissioned and all its electronics are installed, or when first using a new or repaired compass, hire a professional compass adjuster like Kaufmann to “swing ship” and use magnetic magic to remove as much deviation as possible on all headings. Although nothing beats having a professional adjust your compass, you can also check it yourself. Find a natural range—maybe a lighthouse on a rock pile lining up with a water tank on shore, or a straight channel running north and south. In my home port of Stamford, Connecticut, for example, the main channel has range markers at the inshore end; line ’em up and you’re running 11 degrees magnetic inbound, 191 degrees outbound, perfect for checking N/S deviation. If your compass is accurate on at leastthree ranges, ideally 120 degrees apart, it will be accurate on any heading, says compass adjuster Capt. Jeffrey Kaufmann. Another method involves using your plotter to determine the bearing of a fixed object and then steering towards it visually while checking your compass. If the compass agrees with the GPS bearing, great; if it’s within a couple of degrees, make a note of the error on that heading. Just remember: Don’t steer by GPS. 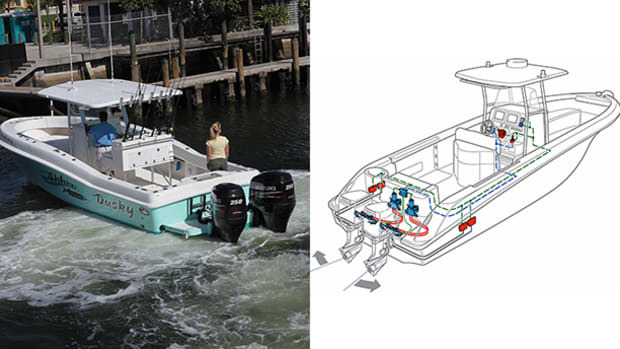 GPS shows your course over the ground (COG) based on a series of fixes, but in strong currents and crosswinds COG can vary remarkably from your boat’s actual heading. Always steer by compass. Yet another method entails comparing your card-compass headings with those of a fluxgate compass. There’s a fluxgate compass in your autopilot, of course, or you can add one, like the KVH Azimuth 1000 ($795 at www.kvh.com), to your boat. 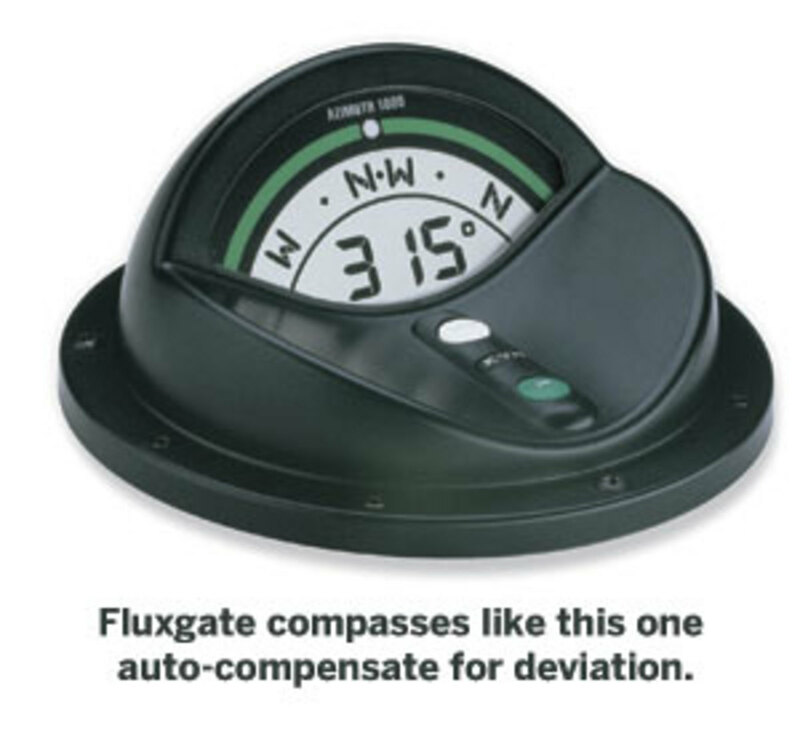 Most fluxgate compasses are auto-compensating: Steer a couple of quick 360-degree circles, and the microprocessor separates the earth’s constant magnetic field from the changing magnetic field of the boat, and removes the latter. KVH says the Azimuth 1000 can compensate itself to within a degree. And finally, if you want to try the sun azimuth method yourself, you can find azimuths in true degrees ataa.usno.navy.mil/data/docs/AltAz.php; instructions for making your very own pelorus at www.compassadjuster.com; and the Handbook of Magnetic Compass Adjusting (formerly H.O. 226) at msi.nga.mil/MSISiteContent/StaticFiles/HoMCA.pdf. Let us know how it all works out for you by dropping us a line at inbox@pmymag.com. Compass adjusting is both an arcane and modern art—arcane because many adjusters still use terrestrial ranges and the bearing or azimuth of the sun to determine compass error, just like they did in the Age of Sail. By noting where the shadow of the sun falls on his pelorus—simply a disk graduated into 360 degrees with a spindle in the center to cast a shadow—and comparing it to where it ought to fall if the compass was spot-on, the adjuster can calculate the deviation, east or west, on each heading. Kaufmann says sun azimuths are still an excellent way to correct a compass, as long as the helmsman can hold a steady course. The modern compass adjuster, however, comes aboard not only with knowledge of sun azimuths, but frequently with a portable gyro, too. The gyro is unaffected by magnetism and doesn’t require a sunny day to function properly, so it’s easy to find deviation by comparing gyro headings with compass headings. Kaufmann says one big advantage of using the gyro is the ability to look over the helmsman’s shoulder to ensure his steering is accurate while marking headings. No matter what compensation method you’re using, steady and accurate steering is very important. “Nobody steers as accurately as a compass corrector,” says Kaufmann. Generally, the adjuster will take successive deviation readings at the cardinal headings—N, S, E, and W—adjusting half the error out each time. He will check the intercardinal headings—NE, SW, SE, and NW—then do it all again. The goal is to get deviation on any heading below a couple of degrees. The process is analogous to making all four legs of a table the same length: Eventually you have to put a matchbook under one, and that matchbook is the deviation table, a list of residual errors, east or west, at different headings. When plotting a magnetic course, you apply the error using the same “west, best; east, least” rule I mentioned earlier to get the compass course. Kaufmann says it generally takes about 90 minutes to swing a compass once a vessel is in open water. 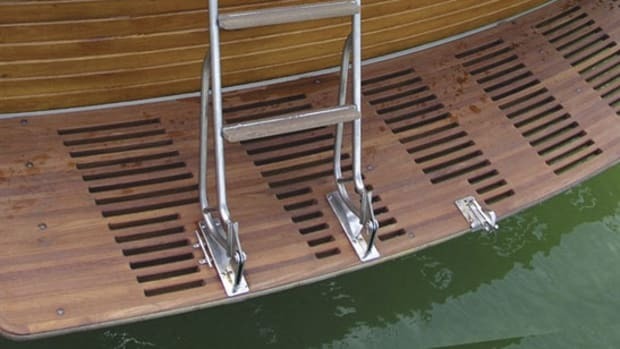 A non-steel boat can typically go five years between adjustments, absent major changes (especially new electronics—electronics and audio-system speakers are the biggest sources of deviation on a non-steel boat, he says), but steel vessels should be adjusted annually, since their magnetic fields can change naturally over time. Military and commercial vessels check their compasses every day, sometimes at every course change. Once your compass is adjusted, treat it with respect. Someday you’ll need it. 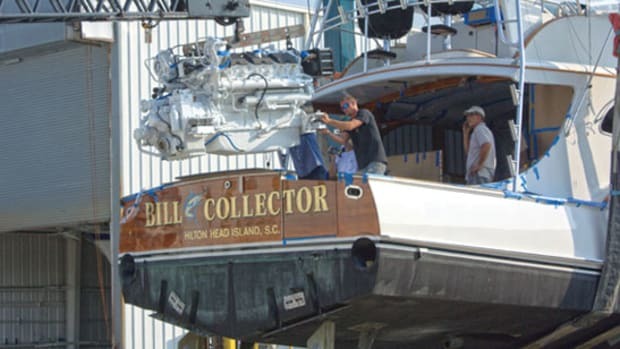 This article originally appeared in the September 2015 issue of Power & Motoryacht magazine.